Always keep the face of the golf club square to the swing path. 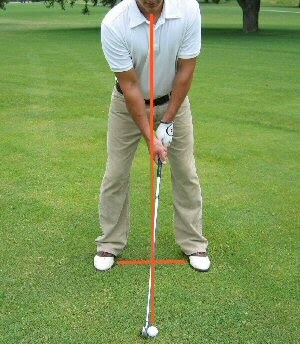 The correct swing path is a slight arc to the inside of your body stand. Must be sure that the shaft is parallel to you feet base, at 3 o'clock position, as you visualize the clock face with the two arms. You must have the club shaft in parallel position to the feet line. The 3 o'clock horizontal club position is highly recommended for your back swing, so you are not far inside nor outside your feet base.